Performers include: Raymond Burr, Don Galloway, Don Mitchell, Barbara Anderson, Elizabeth Baur, Gene Lyons, and Johnny Seven. 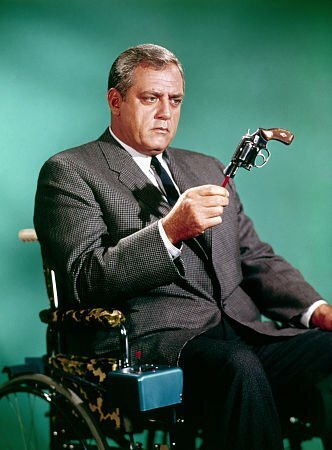 After 20 years of police service, San Francisco Police Department (SFPD) Chief of Detectives Robert T. Ironside (Raymond Burr) was forced to retire because a sniper’s bullet paralyzed him from the waist down, confining him to a wheelchair. He later gets himself appointed (in a clever way) a “special department consultant” by his good friend, Police Commissioner Dennis Randall (Gene Lyons). He requests that Detective Sargent Ed Brown (Don Galloway) and young socialite-turned-plainclothes officer Eve Whitfield (Barbara Anderson) be assigned to him. Ironside also recruits angst-filled African-American ex-con Mark Sanger (Don Mitchell) to be his personal assistant and bodyguard. Sanger eventually becomes a police officer and graduates from law school. Midway through the series, Officer Fran Belding (Elizabeth Baur) takes Eve’s place (when Anderson left the series). Ironside operates out of an attic floor room at the SFPD headquarters and makes use of a specially modified and equipped Ford police truck. This is later replaced by a modified day van. The story of Ironside began with a two-hour TV movie, Ironside, which aired March 28, 1967. Ironside and the Chief travel to a farming community. They’re hoping to help Porter Yarborough (William Katt), a recent parolee who’s been charged with cattle-rustling. Porter is the son of a rancher named Clint Yarborough (John Larch). In addition to clearing Porter of the charge, Ironside also tries to mend the rift between the crusty father and his artistic son. First aired: N/A (the final three episodes were not aired on NBC). Ironside has recently retired and is looking forward to running his vineyard with his wife, Katherine (Dana Wynter). His retirement is cut short however when his old friend, Ed Brown (who’s now working for the Denver police department), asks him to fill the vacancy left by the untimely death of that city’s Chief. Ironside agrees to fill the post, but only temporarily. The situation is further complicated when Suzanne Dwyer, the daughter of his former colleague Eve Whitfield, becomes the prime suspect in the murder of her boyfriend, Mike Quinn. Suzanne suspected that he was having an affair, followed him and found Mike with another police woman named Judy. She flees and, the next morning, Judy and Mike are found murdered. Though Ironside refuses to believe that Suzanne is guilty, the evidence points to her. Ironside’s other old friends — Mark Sanger and Fran Belding — come to Denver to help. It begins to look like the murders of Mike Quinn and the previous Chief may be connected and that someone in the department may be the guilty party. First aired: May 4, 1993. What do you think? Do you like the Ironside TV series? Do you have any favorite episodes or memories? I liked the program and was wondering why it never runs on stations carrying older programs. I am watching the early days of Perry Mason now but would like to see Ironside. Always enjoyed watching any program that Raymond Burr was in. Perry Mason is still number one in my book along with Ironside. I .ve been watching Ironside onthe internet Netflix and still love watching it even though I’ve seen it before I never get tired of the old tv shows they just have something about them that the new shows don’t have. I LOVE Ironside. I was raised in San Francisco in the 40’s to 60’s and it makes me feel at home watching the City as it was then. The characters are all so great! Please keep showing it on MeTV. I can’t believe your not giving that show more time, between you ,CBS and ABC,I really don’t believe you know what a good show is any more. NBC is known for not giving new series a fair chance. They cancelled Ironside once, why would they bring it back? Besides, the whole concept was wrong. There are too many fans of the original show. I’m still watching it on MEtv. First, his last name should have been something else but after he was shot everone start calling him Ironside. What the hell are you talking about? That was always his name. What a weird comment. I love this show and think it deserves more time to garner a good audience.